The US dollar fell against all major pairs on Thursday. The greenback had touched 16-month highs on Wednesday but could not hold on to those gains amid positive Brexit news and solid trade data in Australia, combined with investors taking profit in their long dollar positions. 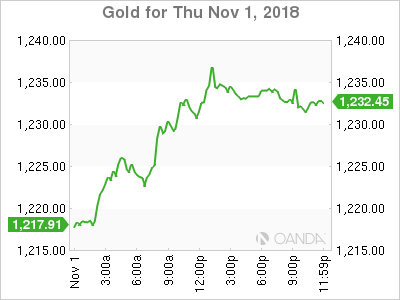 The release of the U.S. non farm payrolls (NFP) report on Friday, November 2, at 8:30 A.M. EDT could turn the tide for the dollar, but investors looking beyond this week will take into consideration political risk as the US midterms take place on Tuesday, November 6. The US dollar lost its appeal as a safe haven as President Donald Trump tweeted about having a good talk with Chinese leader Xi Jinping. The two will meet in Buenos Aires ahead of the G20 summit, with trade a big topic under discussion. The EUR/USD rose 0.90 percent on Thursday. The single currency is trading at 1.1412 after the US dollar hit a brick wall after on its way to a 17-month high. 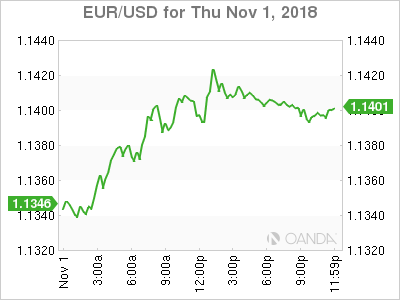 The scenario of a US economy overperforming in trade war risk aversion gave strength to the dollar, but the script has changed with the US dollar on the back foot as the major upcoming risk event are the US midterms, with investors limiting their dollar exposure while positive indicators have appeared abroad. The euro rebounded against the greenback with an eye on the US jobs report on Friday. Employment has been a strong pillar of growth and supported the view of the Fed to keep tightening monetary policy. The upcoming October data will not change that, but it will have to be exceptional to change the view of the market on perceived political risk out of Washington. Europe is no stranger to political risk as it battles on two fronts. The Italian budget dilemma continues after the European Union rejected the proposal of a member for the first time and gave Italy three weeks to make a list of changes. Italian politicians are digging their heels as Brussels and Rome head for tough negotiations. The GBP/USD gained 1.96 percent. The currency pair is trading at 1.30 after reports of a financial services agreement between the EU and the UK made the rounds. Officials from both sides denied there being an actual agreement, although the matter, as anything Brexit-related, has been discussed for months. 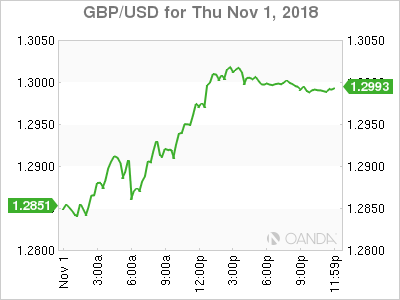 While it was deemed as speculation, the fact remains that it was also not denied which was good enough for the market pricing in further pound strength. The various comments, both official and unofficial, point to a deal being close. As always with Brexit rhetoric, there have been few details disclosed. There is optimism on both sides, although the team in Brussels is more cautious. As part of its “Super Thursday,” the Bank of England (BoE) Governor Mark Carney had a neutral rhetoric about the Brexit outcome, saying the central bank is ready to do what it must in either outcome. He did comment that the hard exit is an unlikely scenario and is confident about the levels of preparations done by the financial services industry ahead of the imminent divorce. Gold rose 1.64 percent on Thursday after trade fears eased, sapping the attraction of the US dollar as a safe haven. The upcoming US midterms are the next major risk event and investors are limiting their exposures to the US currency. The US economy has been a solid performer this year and the U.S. Federal Reserve has moved towards rate normalization with three rate hikes in 2018. Another rate hike is expected at the December Federal Open Market Committee (FOMC) meeting, if economic indicators remain strong. Gold has reclaimed a seat at the safe haven table after a difficult start of the year. Demand for the metal has risen from retail investors and central banks keeping prices above $1,230. 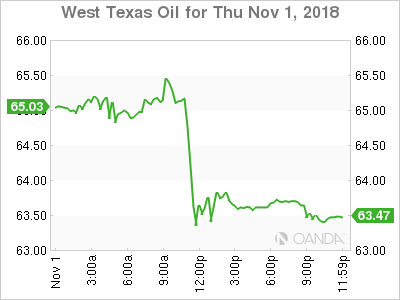 Oil prices tumbled on Thursday as the market is anxious about oversupply ahead of the start of Iran sanctions. Organization of the Petroleum Exporting Countries (OPEC) and other major producers appear to have gotten the message from US President Donald Trump and increased production, but there are still questions on how much will the sanctions actually impact Iranian exports. Iran’s biggest customers have bowed down to US pressure and might still work out exemptions or try to exploit loopholes to keep purchasing crude from its long time supplier. There are reports that India was able to get US sanctions waivers in exchange from reducing its Iranian imports by 35 percent.